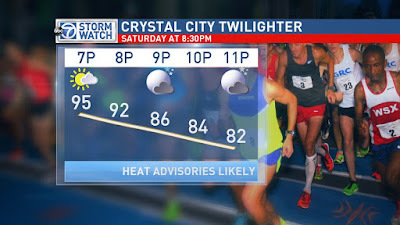 Unfortunately, Saturday night's rough weather forecast lived up to the hype. While every racing member of GRC rose to the occasion, some fared better in the heat than others. Frances Koons was the star of the evening, winning the women's race in an impressive 17:05. Her ability to withstand heat and humidity while harboring a summer cold can be best described as a superpower. Way to go, Frances! While many eyes have been trained on the professional running scene in anticipation of next month's Rio Olympics, GRC's own Beth Young has been busy in Miami supplementing her hard training with the hard prosecuting. On Friday, the U.S. Justice Department announced charges against the owner of a network of nursing facilities that have allegedly defrauded Medicare and Medicaid of over $1 billion, the largest case of health care fraud in U.S. history. The national news media has been quick to take notice of Beth and her team's work, with front-page stories in the New York Times and Wall Street Journal. Although he declined to comment for the Times and WSJ, Coach Jerry offered this blog exclusive comment on the record-breaking case: "I've been a lawyer at DOJ for 25 years, and I can attest that success as a lawyer is like success as a runner, in that the results the public sees are the product of countless hours of hard work behind the scenes, and Beth certainly put in the work to achieve this great result." Heat be damned, Coach Jerry is still optimistic. "We're excited about bringing a large and talented group of athletes," he said. "No one is particularly sharp, and with the looming heat we're not going to see any PRs, but there will be some strong performances. For the women, Frances Koons will make her return to competition after a long injury-induced layoff, and while she's not race fit, she is ready to give it a solid test run. I'm also expecting strong performances from Steph, Amy, Frances L, Maura, and Kerry." It's likely that the men will make no such attempt to warm up in a horizontal line. Speaking about the men's propsects, Coach Jerry explained, "we're just getting back to work, and this will be a rust buster for the whole gang." A word to the wise for all spectators: stand far back from the course on Saturday, or risk being caught in a deluge of sweat from passing GRC runners. Sources report from the DCRRC Mile Championships that Tom Kelly has completed yet another summer track race. When pressed by the media, Tom refused to disclose how many races he's run in the summer months for GRC over the past few years. The number is believed to be in the hundreds. 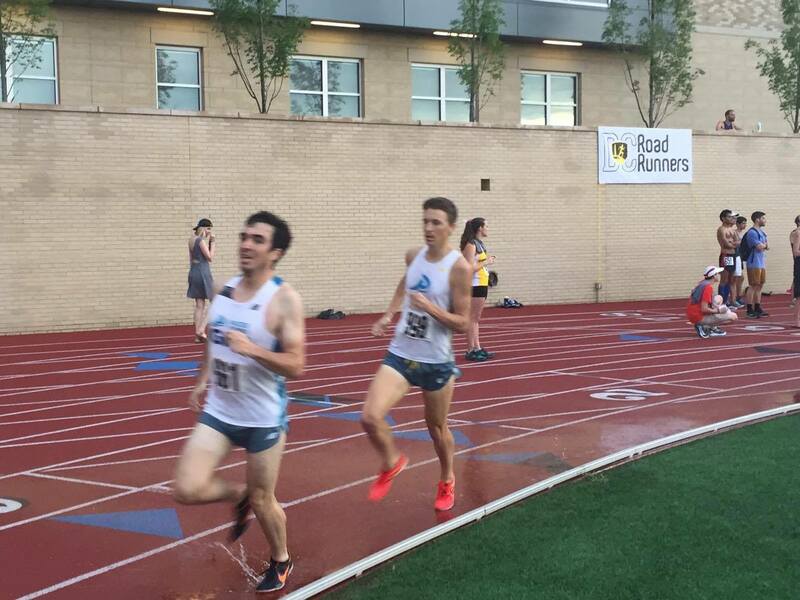 He finished in 4:31.3 for 6th in predictably awful July weather conditions. Despite a relapse of a serious foot injury in January, our beloved TK has made yet another impressive comeback in a short period of time. 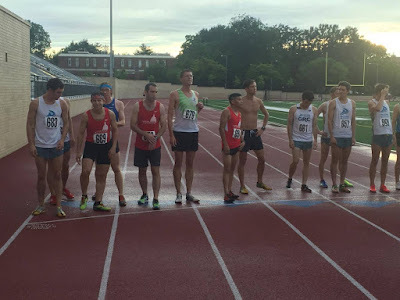 Tonight's performance was preceded by a 2:03.1 800m on 6/28 and a 4:31.9 mile last weekend. 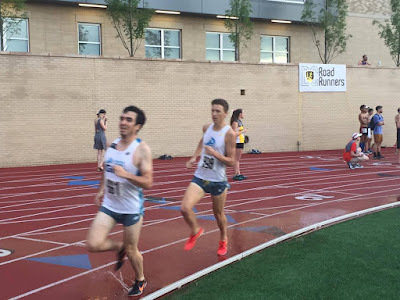 Eyewitnesses also report that there was a Charlie Ban sighting in the men's elite heat, but our staff is still trying to corroborate the scuttlebutt.